Vocal Studio Pro II is the all-in-one solution for your computer-recording projects. Lay down vocals on your latest tune. Narrate your next podcast. 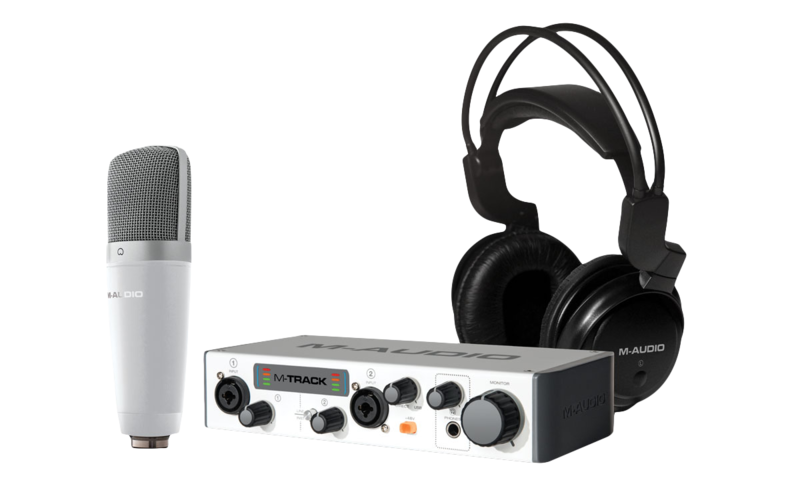 Add a voice-over to your multimedia production. Vocal Studio Pro II does it all. The unique combination of high-performance hardware and easy-to-use software makes it possible. Make sure to have the included XLR cable and the unit already connected to your computer. Plug the female end of XLR cable into the end of the microphone. Plug the male end of the XLR cable into input #1 on the M-TRACK MKII. Plug the USB cable into the M-TRACK MKII and the other end into your computer. This gives the M-Track MKII power, and allows it connect to the programs in your computer. Turn the switch for +48V up to turn on the Phantom Power. Phantom power allows condenser mic's like the one included to be able to work and function properly. Test the mic by gently tapping or speaking into it. Turn the Gain knob up slowly to increase the volume of the mic's signal going to the M-TRACK MKII. You will know it is working by seeing the LED indicators on the M-TRACK MKII go up and down. The M-Track MKII is class-compliant, meaning it does not require any additional drivers. This means you can just plug it in and get started with the following Ableton setup without needing to install any additional software. However, there is an optional low-latency ASIO driver for Windows that may improve the performance of the unit. The driver is available for download from the Drivers & Updates page on the M-Audio webiste. 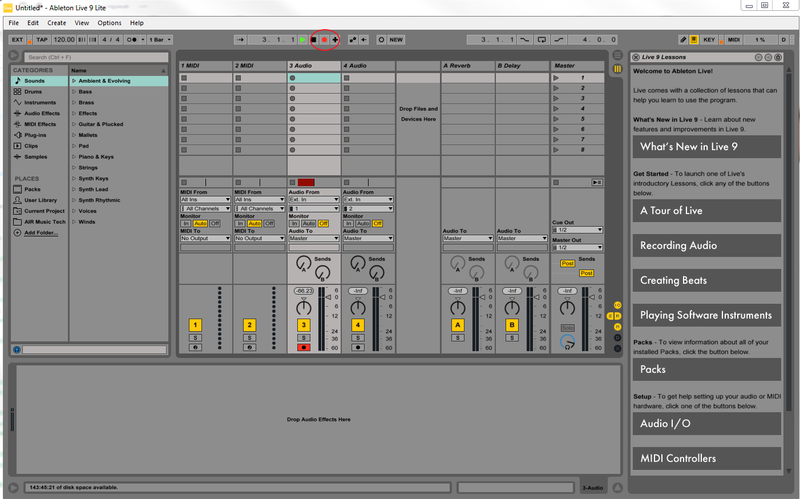 Open up Ableton Live Lite. 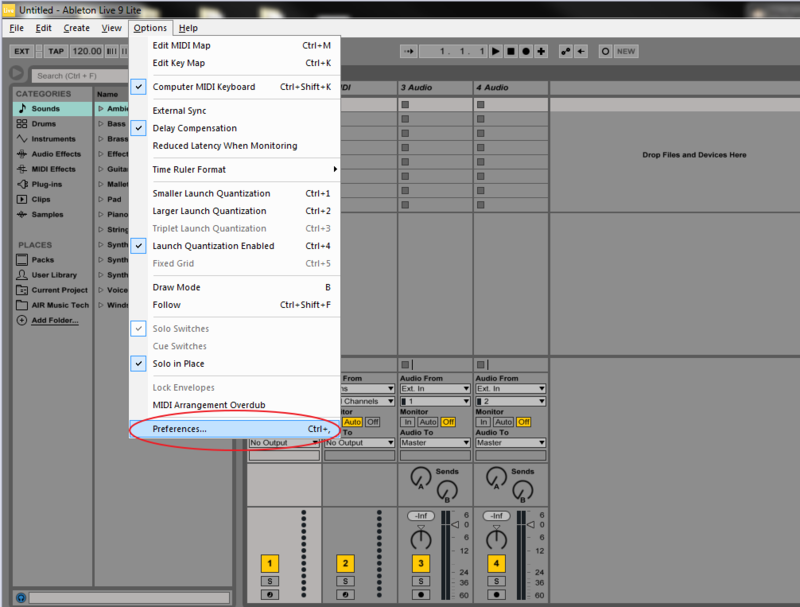 If you need help installing or authorizing your software, please refer to Ableton's handy guide. Once Ableton is open go to Options > Preferences. On a Mac this will be Live > Preferences. In the Preferences window, click on the Audio tab. 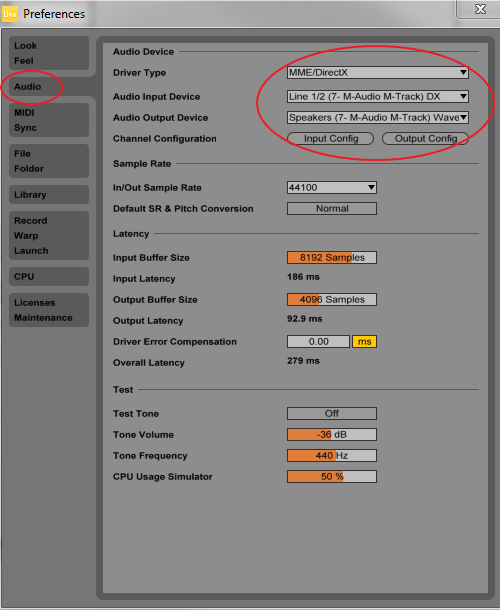 For the Driver Type, select MME/Direct X and then the M-Track MKII as your Audio Input and Audio Output devices. 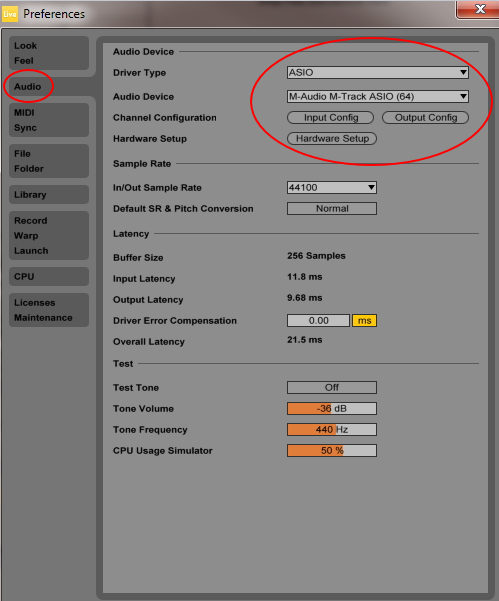 On a Mac you will choose CoreAudio instead of MME/Direct X.
Alternatively, if you have chosen to use the additional M-Track ASIO driver for windows, select ASIO for Driver Type and select M-Track ASIO as your Audio Device. You can now exit out of this window. Go to View and select In/Out. This will bring up the input and output options of any audio tracks you've created. 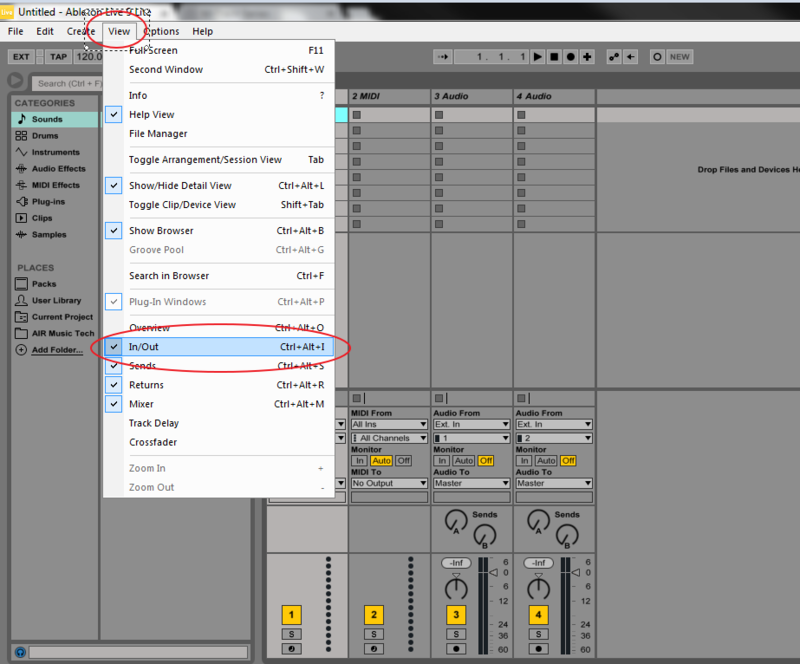 On your audio track, set your Audio From to Ext. In and set the input to be either input 1, 2, or 1 & 2 (if you have a stereo signal plugged into both inputs of the M-Track II). Clicking on the Record Ready button will arm the track and enable you to monitor your incoming audio. At the top of the screen, pressing Record and then Play will begin your recording! When you're finished you can press stop to end the recording.